The All-on-4 procedure uses four titanium posts implanted in the jaw to permanently and securely hold a denture. This method is far superior to and much more convenient than wearing conventional dentures. 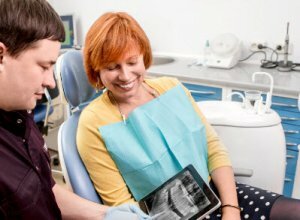 An All-on-4 procedure could be the perfect solution to your dental health needs. An All-on-4 procedure is where we utilize four dental implants and then build porcelain teeth that are permanently attached to those dental implants. Typically, a patient that is a candidate for an All-on-4 procedure may be wearing full dentures already. Another candidate would be a patient that has advanced periodontal disease or gum disease and maybe facing the complete loss of their teeth. All-on-4 implants have the ability to make you smile again. With this procedure you will experience a remarkable degree of tooth stability, chewing ability and enhanced comfort. Your new teeth will look like your own real teeth and be nearly as strong. You will be able to laugh around the dinner table with friends without worrying about your teeth looking fake or coming loose. Implants help to prevent the loss of jawbone and the deterioration of the facial structure that is usually associated with missing teeth. The loss of the support structures in the face, bone and teeth accounts for the hollow look that is common for people with missing teeth. The “caved in” appearance and wrinkling of the lips is virtually eliminated with dental implants. All-on-4 implants allow you to enjoy any type of food without the fear of your dentures slipping and giving you away. Whether you love to eat steak, hard candies, nuts or popcorn, you have nothing to worry about with All-on-4 implant supported teeth. For more information on All-on-4 implant procedure, please contact Prestige Oral Surgery at 732-297-7000.